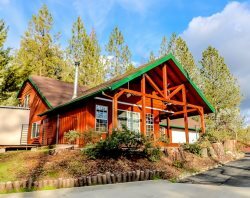 This fantastic cabin provides a great room with a great view, looking out to the large deck and surrounding forest full of tall pine and cedar trees. The living room features a tall rock fireplace, large-screen TV with Dish satellite service, and a comfy leather sectional sofa. The home has three bedrooms, two full bathrooms, kitchen, dining room, and a large den with a pull-out sleeper sofa, as well as games and a TV. The home provides central air conditioning and heat, with a full HEPA-grade HVAC filtration throughout the house; a full-sized washer & dryer; and a 4-burner propane grill on the deck. Two bedrooms have queen-size mattresses; the third has a full-size bed, and two twin beds. The downstairs den has queen-sized pull-out sofa bed. The Fish Camp area is just a few mile from the south gate entrance to Yosemite Park on Hwy 41.